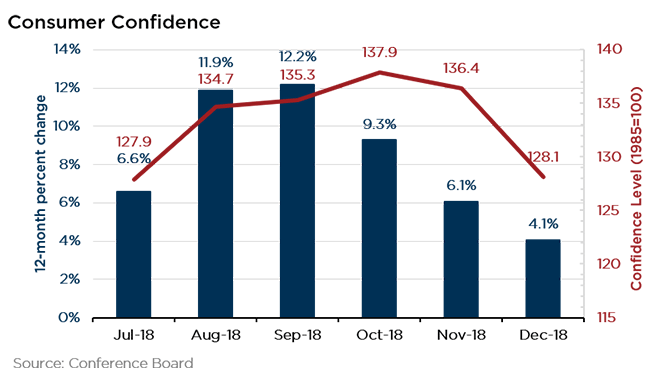 Consumer confidence dipped for the second straight month, falling to 128.1 in December from 136.4 in November. The December decline was the sharpest in more than three years, further exacerbating concerns about a global economic slowdown making its way to the U.S.
“While consumers are ending 2018 on a strong note, back-to-back declines in expectations are reflective of an increasing concern that the pace of economic growth will begin moderating in the first half of 2019,” said Conference Board Director Lynn Franco, whose organization publishes the survey. Despite the decline, consumer confidence remains historically strong. Consumer spending in November reflected still-historically high levels of consumer confidence. 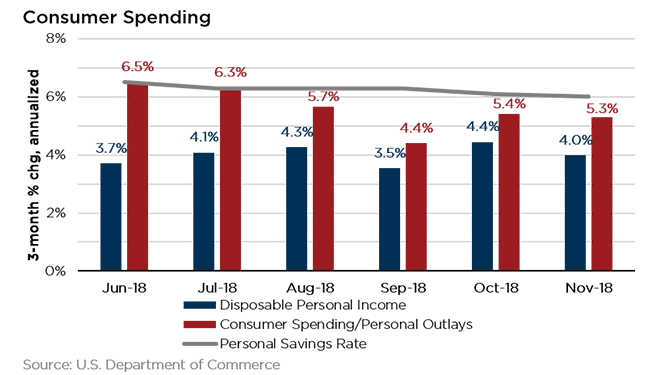 According to the Commerce Department, personal consumption expenditures increased 0.4 percent in November from October. “The consumer is on fire, and, I’m sorry if the stock market is trying to signal that the U.S. economy is crumbling. Mr. Market is wrong,” said Stephen Stanley, chief economist at Amherst Pierpoint. The latest U.S. Travel Barometer reported that 86 percent of Americans searching for lodging in December were looking to remain stateside—a significant jump from the 69 percent searching domestically this time last year. 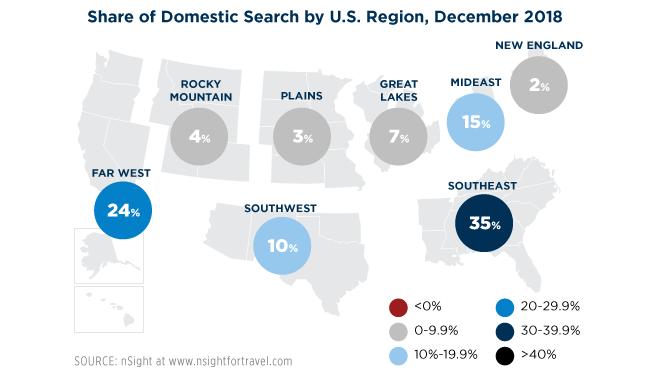 Of those searching for domestic lodging, 35 percent were searching for lodging in the sunny Southeast, while 24 percent were searching in the Far West. A recent poll in the United Kingdom—the top overseas inbound market to the U.S.—recently ranked the world’s top road trip routes by how Instagram-worthy they are. Thanks to our diverse landscapes, U.S. road trip routes were the clear favorite: the iconic U.S. Route 66 took the top spot, followed by the route from the South Rim to the North Rim of the Grand Canyon and the Pacific Coast Highway. “The influence of social media has had a huge impact on destinations of choice, bringing increased awareness of less well-known areas, as well as ensuring that gems such as the Route 66 are still as popular as ever,” said Temerity Vinson, senior director of international marketing at Hertz. More than two-thirds of millennials polled said the places they see on Instagram affect their choice of travel destination, and 30 percent of millennials said they were unlikely to visit a destination they have not seen on Instagram. Just 13 percent of adults over the age of 38 said the social media platform affects their choice of destination. A deeper dive into the data and insights available in the January 2019 U.S. Travel Outlook—which includes the latest data on employment, transportation, inflation, consumer confidence and more—is online here. U.S. Travel Association members receive the full U.S. Travel Outlook, plus a myriad of other cutting-edge data and insights relevant to the travel industry. Learn more about the benefits of becoming a member here—or simply continue to enjoy a small taste of U.S. Travel’s research insight each month here, with the Research Round-Up.